Traditionally, this dish is made with Orecchiette. But. I didn't have any...and I did have Pipette, so I went with it. 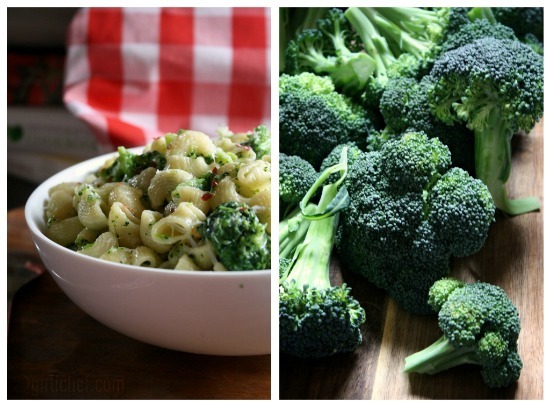 Pasta with broccoli is very common in its many variations not only in our house, but across the globe. Broccoli is a veggie that all of the kids and adults in the house enjoy without question...so that makes this a go-to dish for us. I don't always use the anchovies. Because, though the kids (um...and the hubs...don't tell) eat them when they don't know they're there, if they see me putting them in? Well, they suddenly "taste them". Obviously it's all in their heads, but what can I say? I love it simple like this, but my daughter loves a light alfredo sauce thrown in. And the boys love it with red sauce. So even though it's pasta with broccoli in its base form...it can make many different meals in its variations. Trim broccoli into bite-sized florets. Cook in a large saucepan of boiling, salted water until just tender, ~5 minutes. Using a slotted spoon or skimmer, transfer to a colander set in a bowl of ice water to shock the broccoli (stop cooking and hold bright green color). Remove from water once cooled and allow to drain. Return broccoli cooking water to a boil and cook pasta according to package directions, until al dente. While pasta is cooking, heat olive oil in a large sauté pan. Add garlic, chile, and anchovies and cook until anchovies are melted into the oil and the garlic smells fragrant. Mash the anchovies with a wooden spoon and then add the broccoli florets and cook for a few minutes more. Taste and season with salt and pepper, if needed. Drain pasta, reserving about a cup of the cooking liquid. Add pasta and reserved water to sauté pan and toss to coat. Grate Parmesan over the top and sprinkle a few extra crushed red chiles on top, if you wish. Serve. Crafty huh? :) Looking forward to seeing what you've created! I don't make pasta with broccoli much...why? I wish I knew :) we always have it handy and I must add the anchovies like you do. I have sneaked in many things, that if they only knew...hehehe! That didn't sound too evil of a laugh did it? Love this simple recipe; I have a feeling anchovies must really give it tons of flavour. We love broccoli, so this one is a keeper. Ohh this looks so yummy! Broccoli is a favorite veggie at our house too, although it is a tough sell in pasta dishes...not sure why. This is quite simply a perfect meal - grand for all seasons. Oh, I just love it! Beautiful and delicious meal! I am sure broccoli will go well with my homemade pasta (come see it!). I just had a version of this last night- it is such a comforting dish for me! Okay, so I looked high and low through Tessa's books for pasta con broccoli and couldn't find a single recipe! I was craving it anyway so I went ahead and made it (without taking pictures mind you). Sigh! Oh well, it was still delicious. Yours looks fab with the red chiles. Guess I'll have to hit the books for something else. with a light alfredo sauce..I'm with your daughter-yummy!! crafty---can't wait to see what you make.. I have exactly the same problem with anchovies. I love them but if my husband sees me using them it puts him off the whole dish! I think they'd be great in here. Love this recipe, make it often like this. Your pictures are beautiful! I also created many variations over the years but my favorite will always be the "basic' version. Oh man, thanks for reminding me - I forgot to put the Tessa book. DUH! 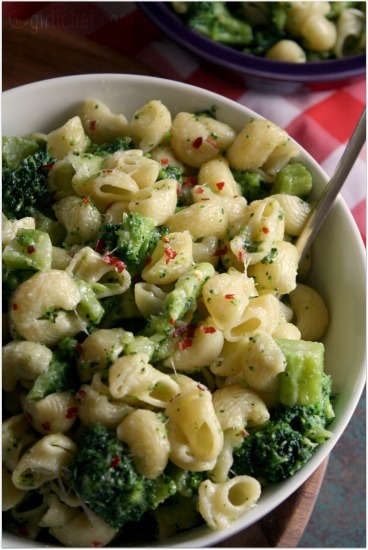 It's from Twelve (Orecchiette con Broccoli)! Oh, you are an evil seductress. I want that pasta like nobody's business. have fun crafting, you should post what you did! what's not to love about a beautiful broccoli dish? That looks like a delicious bowl of pasta..
Pipette are fine, and spaghetti too! I also like to use orecchiette but here in NZ I cannot find them in every shop like in Italy, sometimes I have to make do with the pasta types that are available. 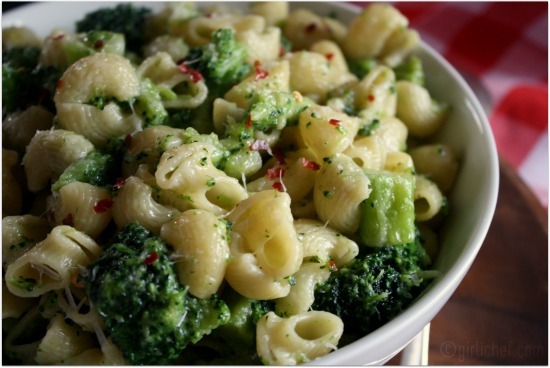 My son loves pasta with broccoli...This is a delicious version! This is a great recipe to keep in my back pocket--easy and adaptable! my kids hates green veggies coz they said its bitter hihi,, but i really want to try this one for my husband i think he will love this . This is a best recipe I have ever read about broccoli.Thanks for providing it on post.So that it has become in reach of people like me. This looks delicious! We love broccoli in our house so this would be a hit with my kids! Broccoli is the one veggie my whole family can agree on also...so crazy. I'm loving the sound of this! And I won't tell about the anchovies if you won't...they really do add that extra special something. This is one of our favorite go to dishes when we're in a real bind for time. Joshua roasts the Broccoli and onions in the oven and we use kamut pasta. Soooo yummy. Gotta sneak in those anchovies! ;-) This looks simple and delicious--easy pasta comfort. Lovely! Simple and delicious family fare. Perfect! And I hope to see your wood creation soon! After reading the recipe and seeing the list of ingredients I am ready to make this tomorrow. It is so easy and looks so yummy.